Like many, I feel hungry more frequently in the winter months as compared to other months. Rather than braving the cold in effort to dine out, I’ve found myself spending more time cooking in the comfort of my own kitchen. 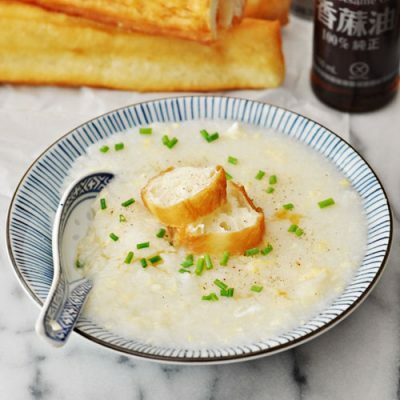 As I grew up in a rice eating household, nothing fills me up more than a bowl of rice! 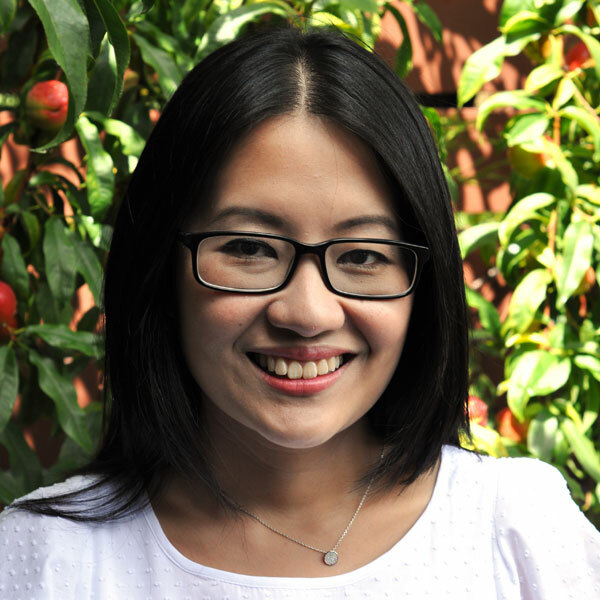 When I was asked to join SunRice Recipe Box Challenge along with other bloggers and Poh Ling Yeow (Masterchef Season 1 Runner Up, star of SBS’ Show Poh & Co and SunRice Ambassador), I was excited at the opportunity because I can have all the fun of a cooking challenge without being on TV ha! 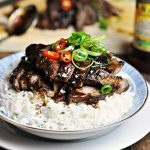 I have accepted the challenge from Chantelle at Fat Mum Slim where I created a recipe based on mystery ingredients set by her. You can see my recipe creation on my Instagram page here. Now it is my turn to pass my list of mystery ingredients to Poh for her SunRice Recipe Box Challenge. 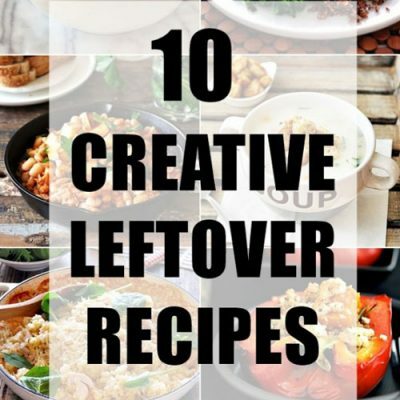 My inspiration for the list was based on the ingredients I had in my kitchen at the time. As if being in one challenge is not enough, I wanted to join in the fun again by creating a recipe based on the list I provided for Poh, to see if I could rise to my own challenge! 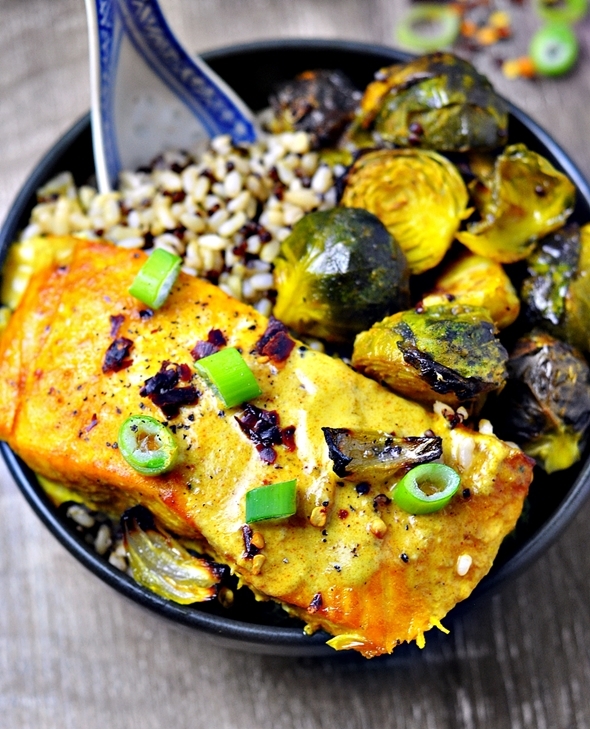 This tasty grilled turmeric salmon and brussels sprouts rice bowl with coconut curry sauce was what I came up with. 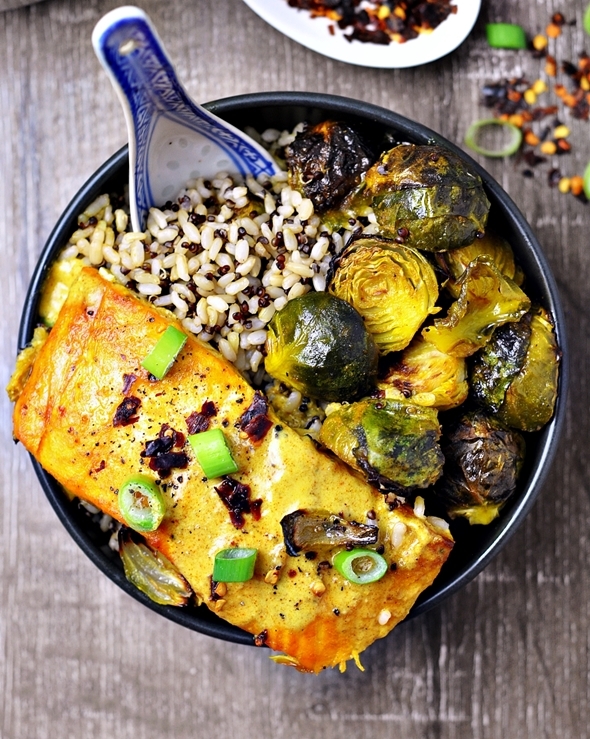 This dish requires minimal handling and is ready to eat in 30 minutes. As a shortcut to making this rice bowl, I used the cooked rice and quinoa from the SunRice microwave range. Speaking of a recipe challenge, I have a competition for you to enter! So imagine this: you are due for your next grocery trip but because the weather isn’t great and you are procrastinating. 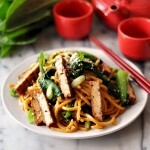 Your tummy is rumbling and you need a quick meal fix. 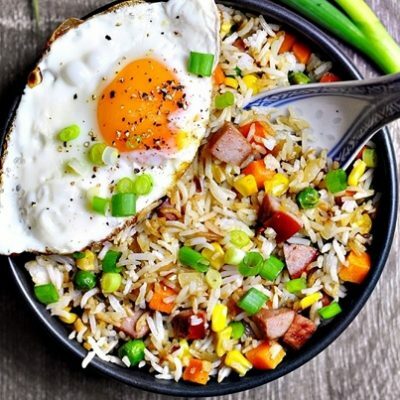 I’ve found my SunRice Golden Fried Rice recipe to be perfect for moments like this. But I want to hear what you like to cook. 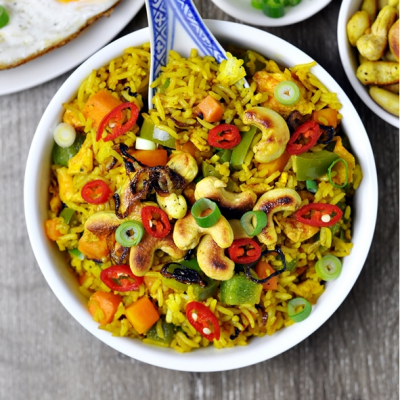 There is a secret cook in all of us and I would like you to share what is your favourite go-to rice recipe in your “I’ve-got-nothing-in-the-house moment” and why. In 25 words or less, write in the comment box below your favourite rice recipe when you are in “I’ve-got-nothing-in-the-house-moment” and why. 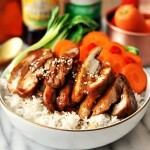 One of you could win a prize pack including a Tefal 8 in 1 Rice Cooker worth $100, a range of SunRice products and a chance for your recipe to be featured in the SunRice Cookbook eBook. (1) If your entry is selected as one of the finalists, you will be required to submit your recipe to SunRice to be considered for the prize and the chance to be featured in the SunRice eBook. So keep your eyes peeled for my congratulatory emails to you! (2) One entry per person. (3) Open to Australian residents only. (4) The competition is open until 26rd August, 2016. Preheat oven to 180 degrees Celsius (356 Fahrenheit). Line aluminium foil followed by a baking paper on a large baking tray. Set aside. 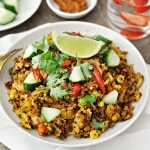 In a mixing bowl, add turmeric powder, cooking oil, maple syrup, salt (about 1 teaspoon) and freshly milled black pepper. Whisk until well combined with a fork. 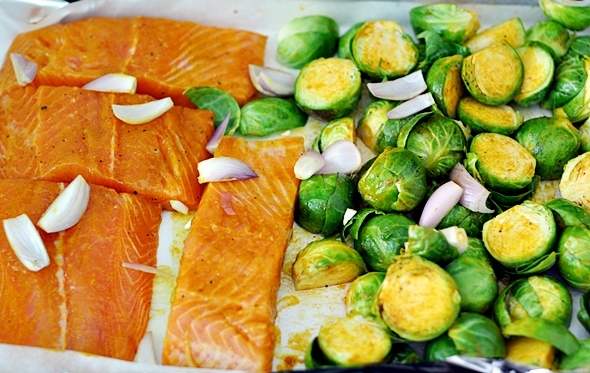 Place brussels sprouts onto one side of the prepared baking tray. Spoon 1/3 of the marinade onto brussels sprouts and mix well using a spoon. Place salmon fillets into the marinade in the mixing bowl and gently mix well to ensure the marinade is well coated with the salmon fillets. Transfer the salmon onto the prepared tray. Scatter French shallots wedges on to the tray. Lightly spray the baking tray ingredients with a cooking spray and bake in the preheated oven for 30 minutes or until the salmon fillets are fully cooked. In the meantime, pour coconut milk and curry paste into a saucepan and cook over medium heat until boiling. Set aside and keep warm. 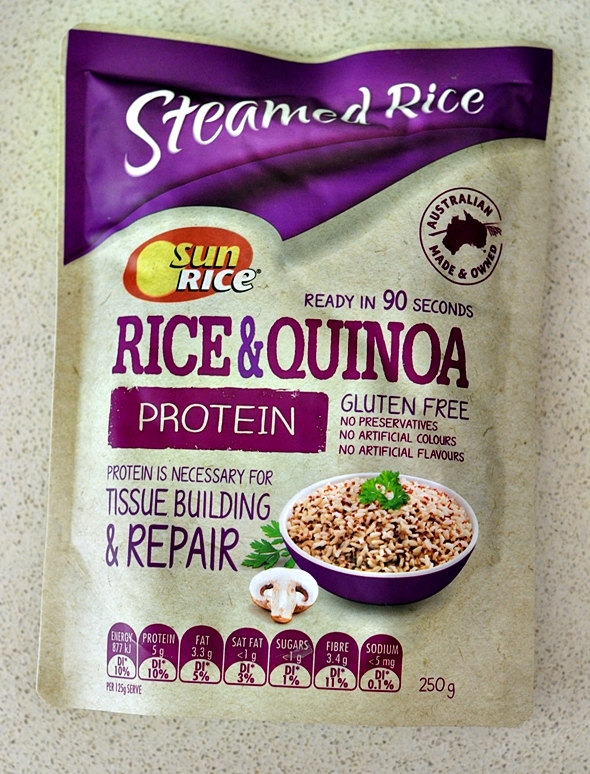 When the salmon fillets are done, heat up the SunRice Rice & Quinoa packets in the microwave according to packet instructions - this will take about 90 seconds per packet. 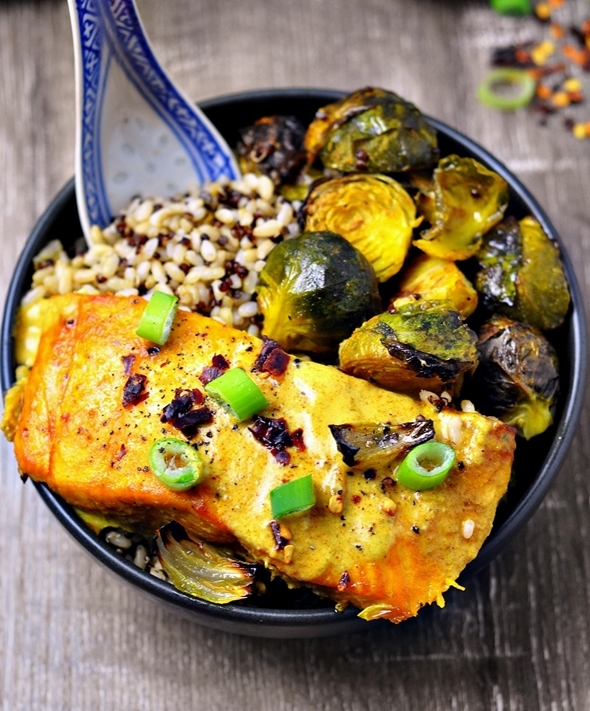 To serve, place rice and quinoa into each bowl, followed by salmon and brussels sprouts. 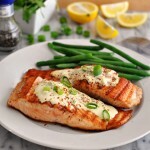 Spoon some coconut curry sauce over the salmon and garnish with sliced spring onion and chilli flakes. My go to is my one pot “Tomato Rice” – beef mince, canned tomato, carrot. Zucchini and corn. 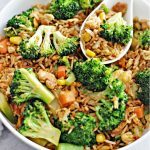 Quick, easy and my kids love it!